Bali is not my favourite place to go for a holiday. Too many tourists. Too many Australians. But I am grateful to my last trip there when, on a whim I decided to skip drinking cocktails by the pool and go for a half day Bali cooking class. 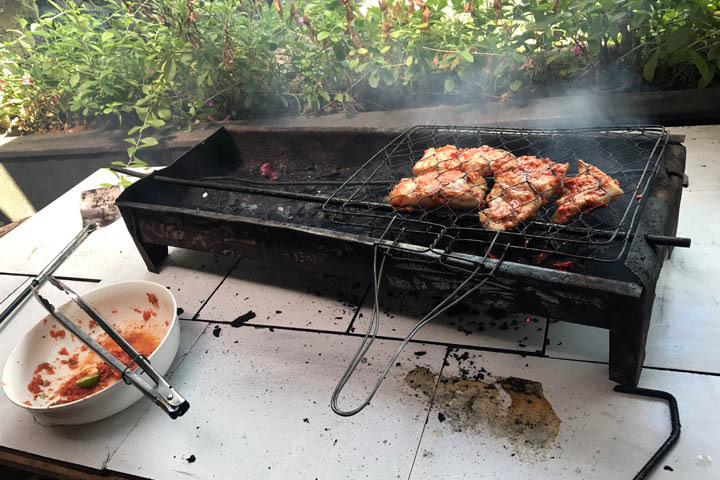 My previous understanding of Indonesian cooking was limited to peanut satay and fried rice. However, attending the Anika Bali cooking class gave me a true appreciation for the complexity and richness of this cuisine as well as the variety of ingredients used. We prepared a several dishes during the class which all tasted delicious, from creamy beef curry and nasi goreng, to bean salad and boiled bananas with palm syrup. 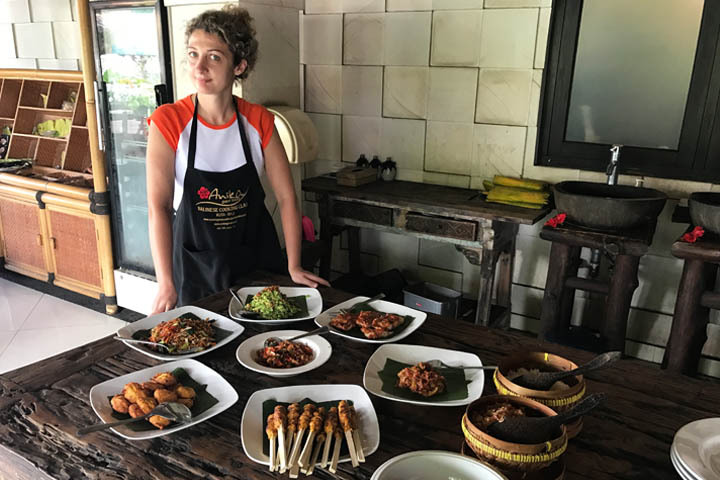 Anika Balinese Cooking School is less than a 30 minutes drive from Denpasar airport and Kuta beach in Bali. For those who don’t know, Kuta is the place for cheap alcohol shots and happy hour beer. 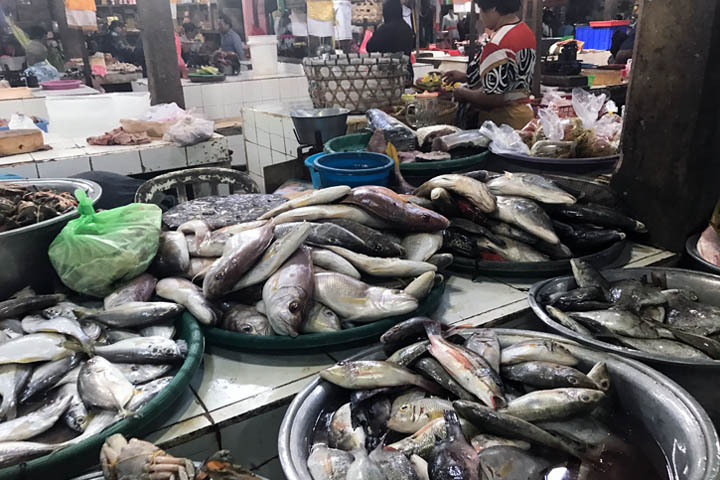 We started the lesson with a trip to the Kuta fresh market, which opens for trade at 5am in the morning and is wrapped up by 12 noon. 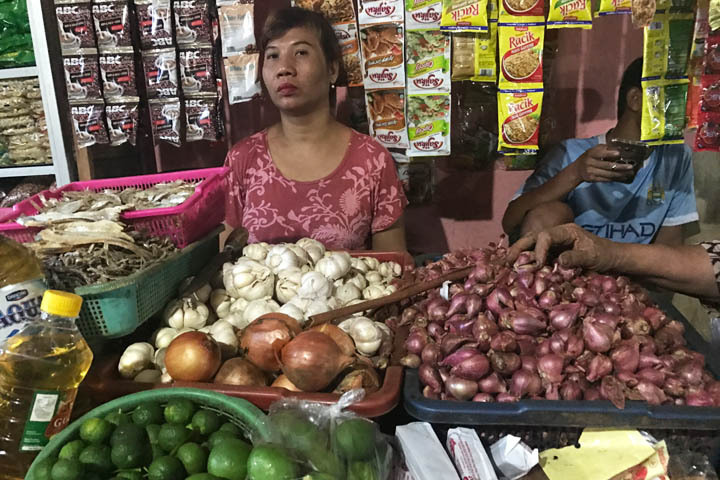 As you approach the marketplace, the first thing you see are women crafting and selling Canang sari. These are daily offerings made by Balinese Hindus and they are found everywhere around Bali, in front of shops, temples and in small shrines constructed on the street. 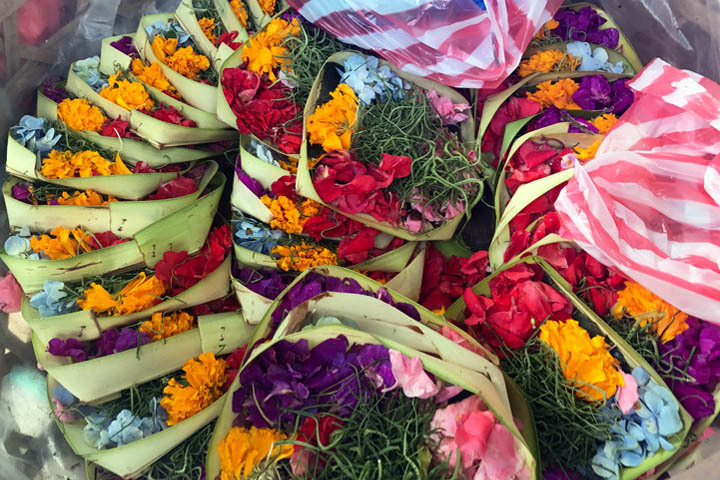 They consist of coconut leaf baskets filled with white, red, yellow, blue or green flowers, and finished with ‘the essence’ which is a burning incense stick or cigarette that helps to carry the offering to heaven. Moving past the Canang sari sellers, the market is predominately indoors with sellers setup at semi-permanent stalls. 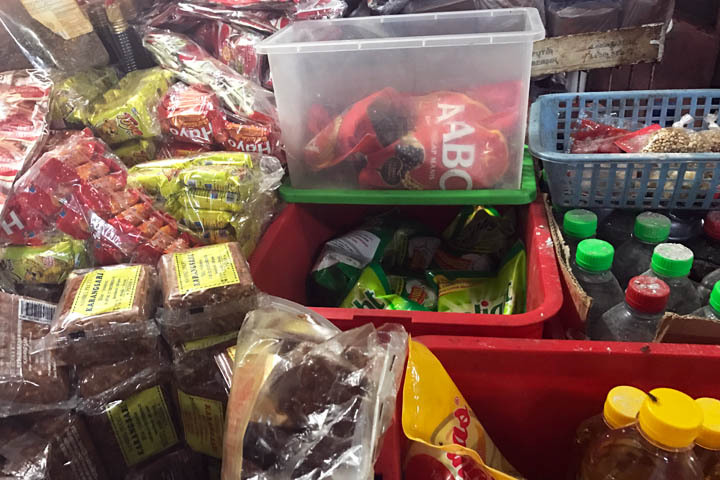 Similar to the wet markets of Singapore and Hong Kong, meats and fish are displayed without refrigeration. We walked past these as we were more interested to learn about the many nuts, spices, roots and shoots that are native to Indonesia and make the cooking so unique. 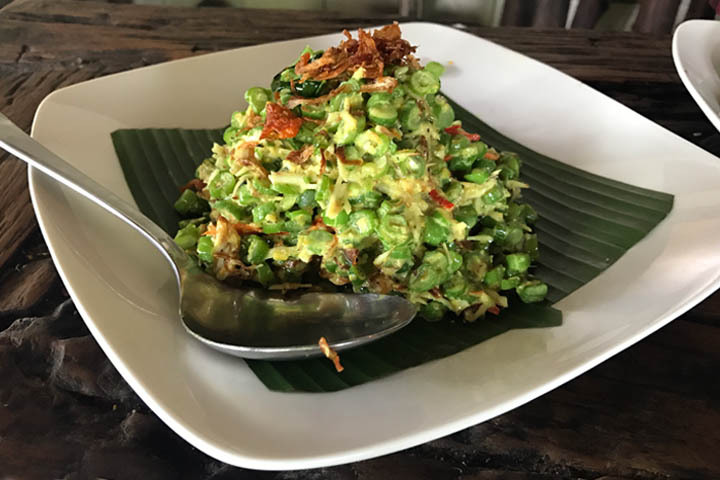 Base wangen means fragrant base, and is a combination of aromatic seeds and nuts that form the basis for all everyday Balinese dishes. It comprises of candlenut, clove, coriander seeds, nutmeg, pepper, long pepper and sesame seeds. As we inspected these ingredients, we were curious to learn about how prized fresh nutmeg is. Native to Indonesia, it has a powerful bittersweet flavour that cools the tongue, aids digestion and prevents discolouration of the skin. It is also highly poisonous because it contains myristicin and elemicin, and so when it is taken in large quantities it becomes a powerful hallucinogenic. In small quantities, it helps to aid sleeping and flavour food. Many different types of roots, some of which I had never heard of, feature in Indonesian cooking. 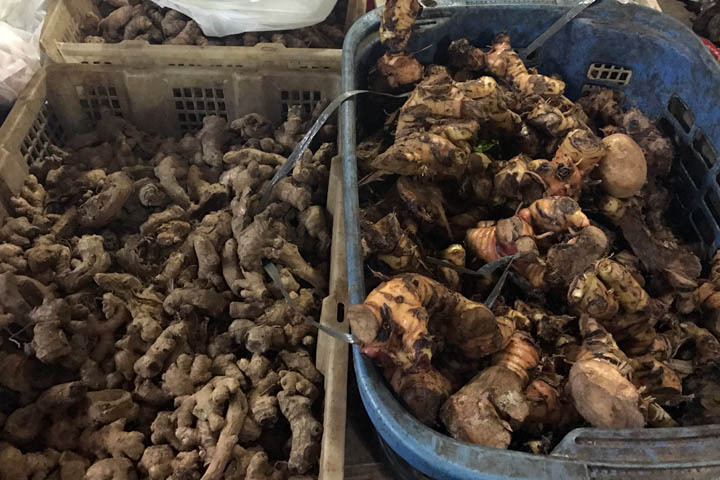 The key ones are galangal (rose coloured with a woody fragrance to disguise fishy odours), ginger, aromatic ginger (responsible for giving Balinese dishes a distinctive taste), and turmeric (bright yellow with a mild, clean taste). I must admit, a lot of these roots looked identical to me and I would find it a challenge to identify them on my own at a market. We then moved on to the shoots, fruits and vegetables. We touched and smelt selections of torch ginger, lemongrass, kaffir lime, coconut, garlic, shallots, tamarind, beans, eggplant and many other wondrous ingredients. After a good hour spent in the market, we headed to the Bali cooking class building where we were served refreshments of hibiscus tea and sticky rice. Following a few minutes repose, we donned our cooking aprons and entered the kitchen. Our first task was to make the base wangen and base genep, and we finely diced selected seeds and roots and ground them into a smooth paste using a mortar and pestle. 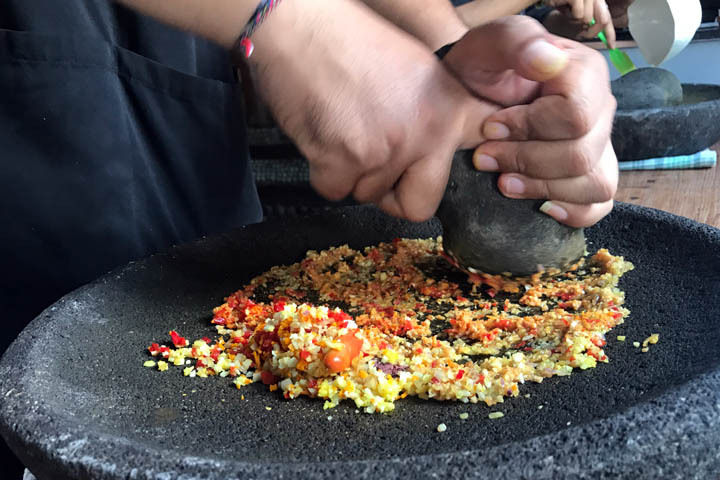 Stone mortar and pestles are preferred in Indonesian cooking as they become imbued with the flavours over time, however you need to be careful you are not hearing a grinding noise when you use them, as that could mean the unwanted addition of a new ingredient (stone) to your food! They say Indonesian women never need to go to the gym, because they have a workout in the kitchen. I certainly found using the mortar and pestle to be hard work and it took at least 10 minutes for me to mince my small quantity of chilli, garlic, torch ginger, galangal and shallots. Some of the base mixture was then mashed with shrimp paste, tomato paste and peeled tomatoes to marinate very meaty fillets of white fish, which we later cooked on the BBQ. 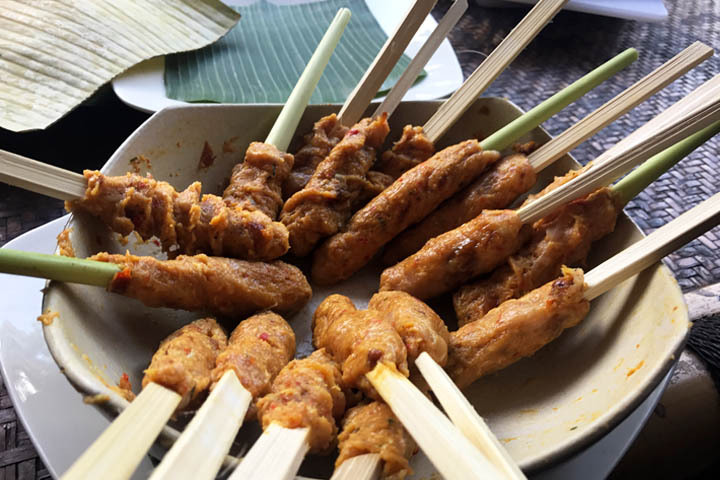 The remaining base was used to make a feast of Balinese dishes including chicken satay with grated coconut, beef in Balinese sauce, tofu fritters, bean salad and roasted eggplant sambal. 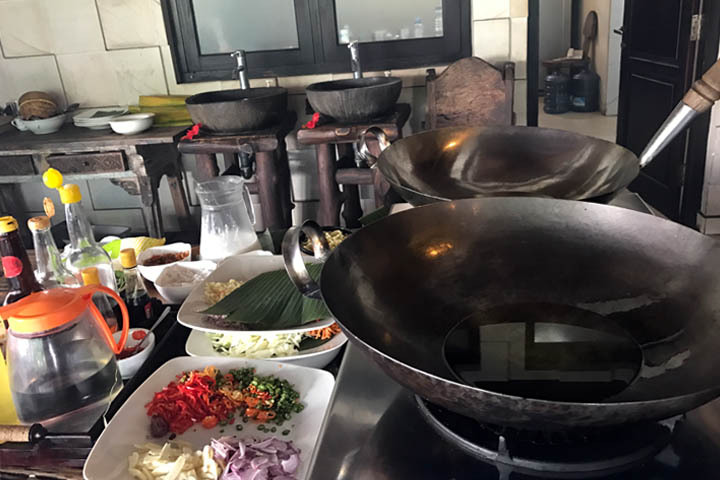 All of these dishes were cooked in massive steel woks using steel spatulas and coconut oil, which heats to a high temperature and provides a delicious flavour to the food. In addition to the lead chef, several apprentices helped us cook the main dishes during this Bali cooking class. At times, we watched whilst they did the difficult parts. This ensured the food turned out well, however I would say the apprentices were a little too hands on and it took away from the learning experience of the students. 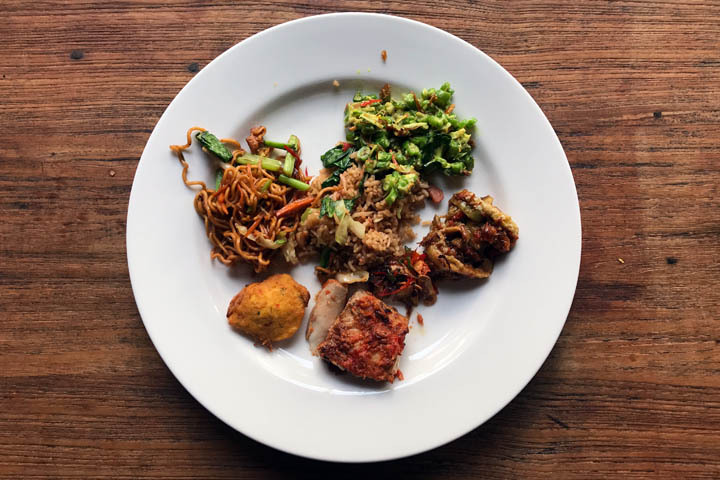 We concluded by preparing the two most famous and easiest Indonesian dishes, mie goreng (fried noodles with meat and vegetable) and nasi goreng (fried rice) after which we laid out all our dishes beautifully and sat together to enjoy a very special feast. The teacher encouraged us to eat in silence using our hands, as is traditional in Bali. However I found it too messy and ate with cutlery. The food was amazing. I never realised Indonesian food could be so fragrant and satisfying. My favourite dish was the beef in Balinese sauce, which was the creamiest and most aromatic curry I ever tasted, thanks to key ingredients of lemongrass, salam leaves, kaffir lime leaves and coconut milk with fried shallot. The sambal was also very special, as the kecap manis, chilli, tomato and kaffir and musk limes infused great flavour into thick-cut chunks of roasted eggplant. 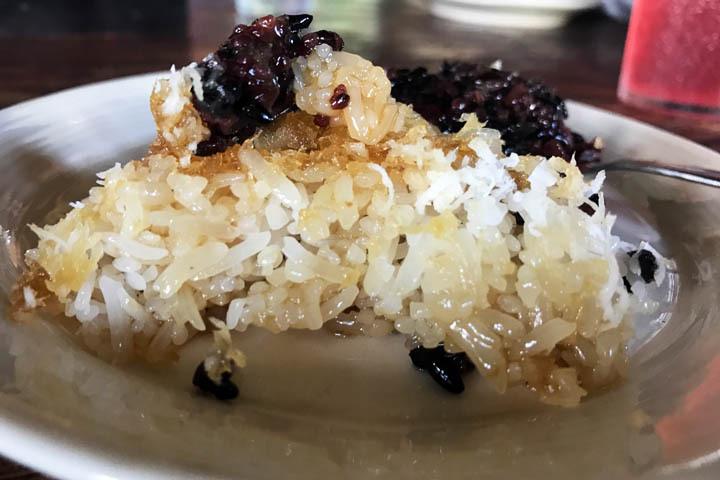 As we enjoyed the last few bites of our lunch, the chef invited us to watch him prepare dessert, which was creamy rice porridge with palm sugar and boiled bananas. 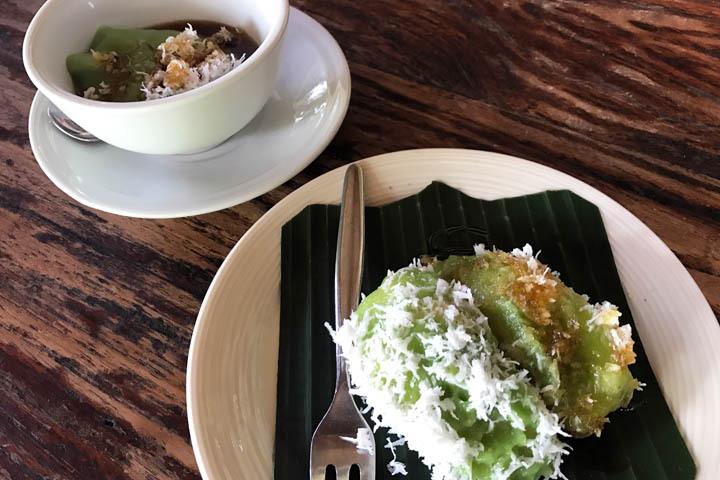 The dessert was a bright green colour, due to the use of pandan leaves, and the glutinous, mild taste was nicely contrasted by the sickly sweet palm sugar syrup. 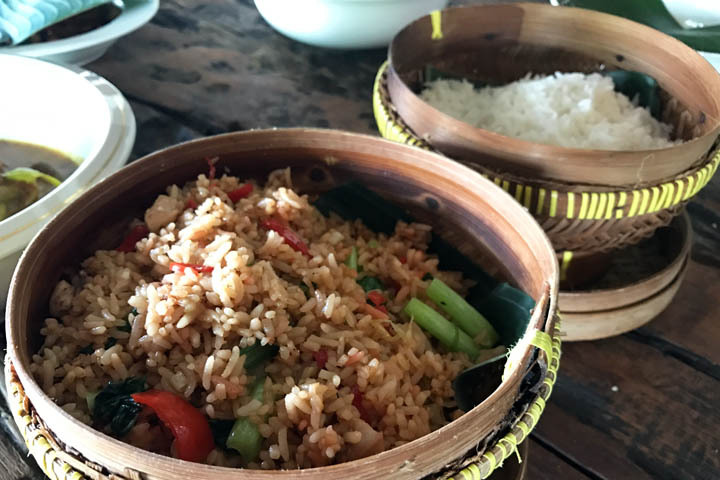 The Bali cooking class was a great experience as it gave me a better understanding of Balinese cooking and the complex flavours used. 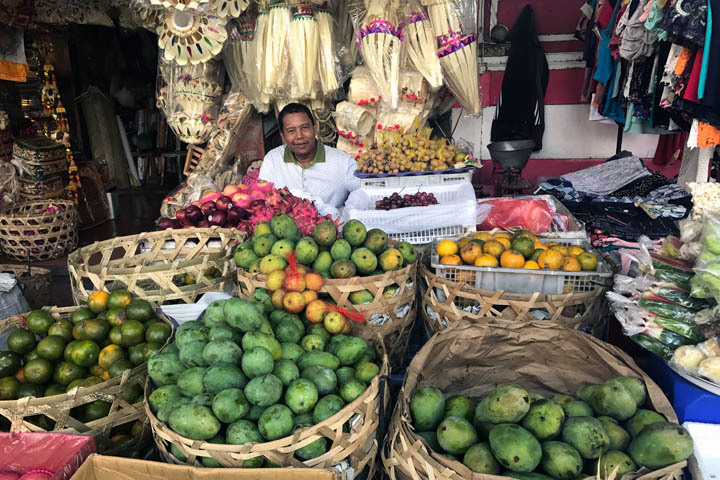 It has encouraged me to explore Indonesian cuisine further and experiment with the new flavours and ingredients I discovered in my own cooking at home. The dishes we made during the class were complex and required certain kitchen equipment, such as stone mortar and pestles and large woks, not to mention a wide assortment of ingredients, that it would be a challenge to replicate at home. At the end of the glass we received a certificate and a cookbook featuring the recipes of all the dishes we had prepared. 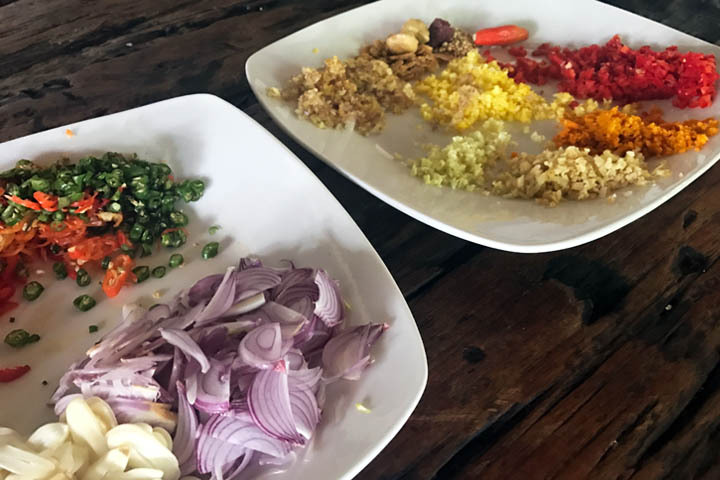 If you are visiting the horrendous Kuta beach for holiday, I highly recommend you take a break from drinking and try a Bali cooking class. It was a memorable and delicious experience! I first fell in love with Bali when I read about it in Eat, Pray, Love. Although I would have to agree with you it’s not that fun when it’s the holiday as there would be dozens of tourists. But it’s a great place for relaxation if it’s non-peak days. I have yet to try a Bali cooking class, how you described definitely makes it sound like something I would try. Thanks so much for the guide!